February 2017 Loudoun County Real-Estate Market Update – How is the Spring Market Shaping Up? Housing Inventory Remains Low – For the 32st consecutive month, active listings declined in Loudoun County, again reaching the lowest recorded inventory number in over a decade. At the end of February 2018, inventory was 18.6 percent lower than the same point last year. This left 868 homes for sale at month’s end, with 1.6 months of supply heading into March. Low Inventory Is Suppressing Sales – The number of closed sales continued to decline. February’s 334 closed sales represented a decline of 5.1 percent over February 2018. This is a continued sign of low inventory suppressing sales, as prospective buyers are severely limited in choices. 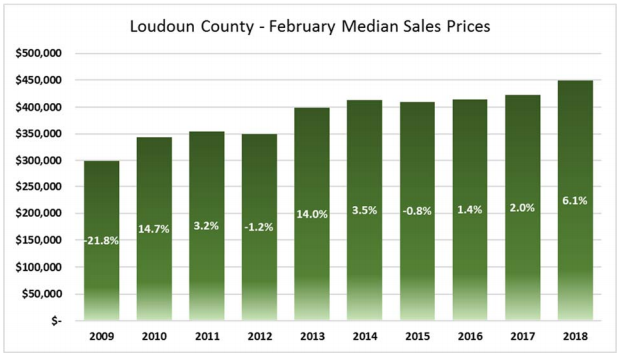 Houses Are Selling Faster – Loudoun County homes continued to sell faster than last year, with half of the February sales listing for 13 days or less—down from February 2017’s median of 17. Sellers Are Getting Their Asking Price – Loudoun County home sellers received, on average, 98.1 percent of original list price in February. After a few months of slow growth, median prices rose 6.1 percent compared to last year, reaching $449,000. lower than the 5‐year February average of 699.
is 29.3 percent lower than the 5‐year average of 1,227.